Tekesh was the 12th century Khorezm Shah who made Khorezm great with conquests as far as Khorosan (present day northern Iran and Afghanistan). He built this mausoleum for himself, along with a large madrassah and library (which has not survived) on the same spot. After his death in 1200 he was buried here. 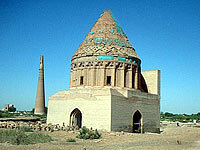 The conical dome, with a curious zigzag brick pattern, is typical of old Khorezm. 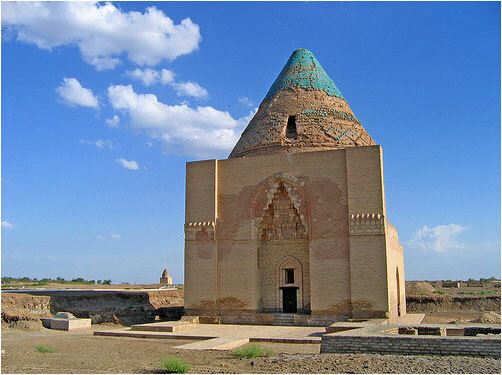 Nearby is a mound of graves called Kyrk Molla (Forty Mullah Hill), a sacred place where Kunya-Urgench's inhabitants held their last stand against the Mongols.